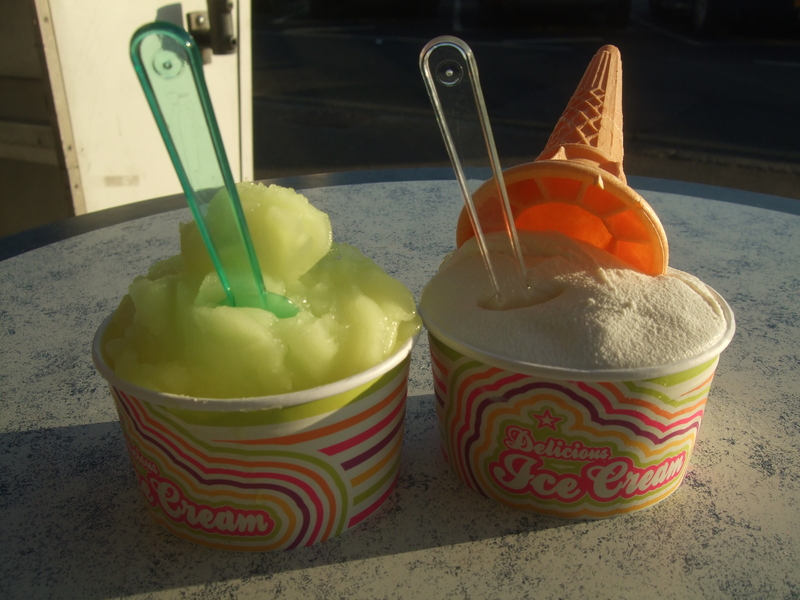 Rossi Icecream – Essex, UK | rubybeanx. Essex is a county in the south east of England. It’s home to such landmarks such as “The World’s Longest Pleasure Pier” in Southend, “The Home of Radio” in Chelmsford, and hosts the cringe worthy reality television series “The Only Way is Essex” in Brentwood. Essex is also the birthplace of one of my favouritest Brit bands Blur, which redeems its coolness from said reality TV show. While I haven’t been lucky enough yet to party at the Sugar Hut like on ‘The Only Way is Essex’, nor have I been able to stroll down the World’s Longest Pleasure Pier as somebody accidentally drove a boat into it and severely damaged a section of it, I have experienced another – much more exciting hometown wonder of Essex: Rossi Icecream. Rossi icecream is a landmark. The factory which resides in Southend should possibly be a world wonder. As much as “glamour” girls stereotypes Essex, Rossi icecream is the well deserved, much loved institution of the county. A Rossi icecream truck even makes a guest appearance driving through the video of Blur’s song ‘Parklife’ (@ 1:50). 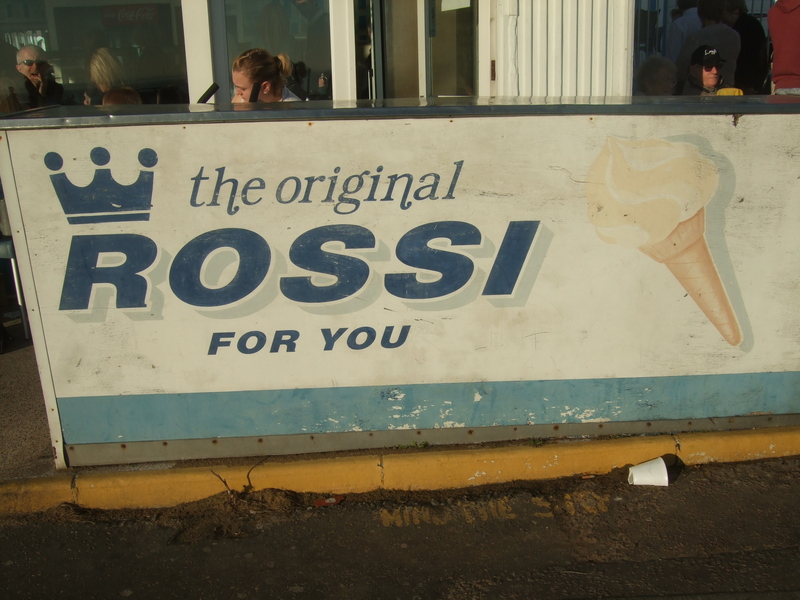 You can find Rossi icecream everywhere in Essex. Every corner store has the icecream machine hidden in the corner. So what exactly is Rossi icecream? Their trademark icecream is a lush vanilla soft serve which in texture is dense but incredibly creamy, in taste is so rich and delightfully sweet. It is simply the result of using fresh milk, butter and double cream but the end product is while familiar, is also surprisingly unique to reflect the quality of local produce. Down in Westcliff-on-Sea, there is a super neat Rossi icecream parlour which sells the full range of Rossi icecream served in cone, tub or gluttonous sundae forms. The icecream parlour sits overlooking a spectacular view of the coast, and is situated in the middle of bicycle and walking tracks, theatre and restaurants. It’s on the way to Southend and makes for a fantasticly scenic cycling or walking destination with Rossi icecream your end point to add back the calories you just worked off. Here you can find the immensely popular, award winning lemon sorbet. The sorbet is a perfected fine balance between the sourness of lemon, and the sweetness of sugar to create a thirst quenching taste of summer. 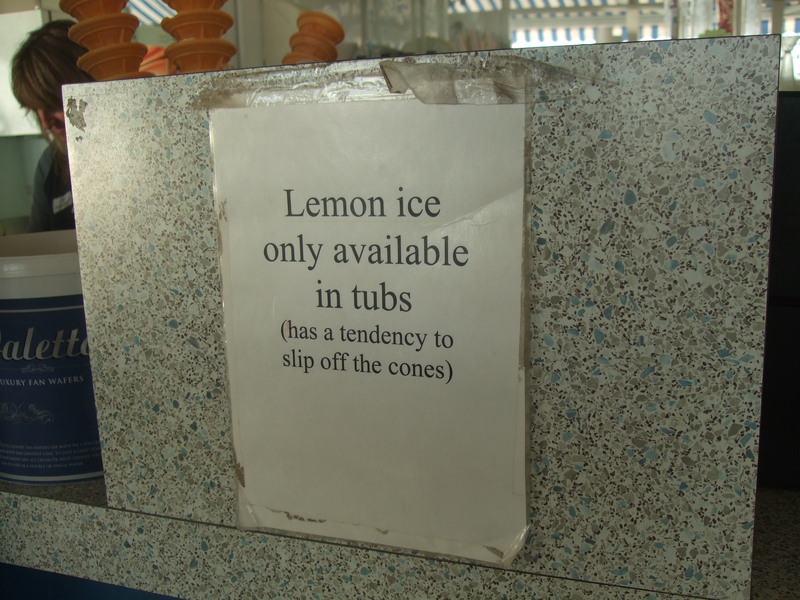 The lemon sorbet is infamously slippery, it comes with a warning that it cannot be served on a cone as when little kids lick it, the ball of sorbet often falls off the cone. The imagery of little kids crying over their fallen icecream possibly makes this lemon sorbet even greater. Don’t: be in a rush, if it’s a sunny day there’ll be lines going down the street! Do: have time to take a good walk around, it’s a very pretty area. You can walk down to the “world’s longest pleasure pier” in Southend! Tags: England, icecream, Rossi, sorbet. Bookmark the permalink.